This morning I was up and ready very early, which meant I had time to organise all of my May Bill Transfers and other boring banking stuff. 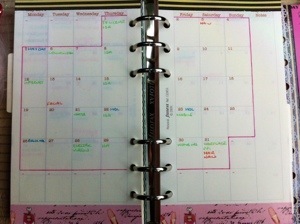 After I did that, I decided to input all of my outgoings to my Filofax Month To View pages. Many of you will know that I find it useful to input everything into a month to view and then transfer over to my week to view so I have an overall picture as well as a close day to day knowledge. Especially where bills are concerned as it allows me to track what’s going out etc… I’m really terrible when it comes to finances so it keeps me on the straight and narrow. What makes you want to use your Filofax more? Filofax Inspiration Comes From Everywhere: Including Underwear Shopping! On Friday I visited a beautiful little boutique style underwear shop that reminded me of all things French. And when I think of French Lingerie, the colours pink, black, white and champagne spring to mind. Beautiful shaped handwritten words, fluffy marabou and lace all create this wonderful vision in my mind. So now, a couple of days later, it’s still in my mind. I’m generally rather bohemian in my style etc, but there’s something pulling me towards the delicate pink French style. 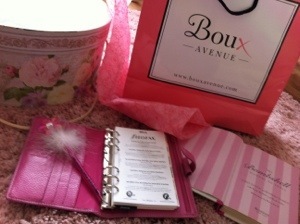 After all, my home is decorated in the shabby chic French style, why not incorporate it into a Filofax?